Regarding Your Emails; Euphrates River. Even though we are in a very nice hotel in Gaziantep, the wireless connection has been less than ideal. That gets time consuming and a bit frustrating. Thanks for writing about tours and other things you want me to take care of. I would like to do so but do not have the time. This is a study tour and we stay busy. If you have written about one of the future tours I will keep your Email and respond when I can back at home. 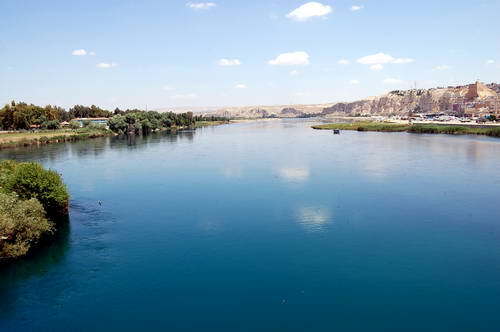 Here is a photo of the Euphrates River that I made yesterday. Read an article I have written on the Euphrates with a photo of the river I made in 1971 near the Persian Gulf. Note the difference in the color of the water in the mountainous region and in the flat area in the south of Iraq. Today we are going to Mount Nemrut (Nemrut Dagi) after a visit to the Gaziantep Museum. We had a good visit to the museum and have now arrived at Katha. At 4 p.m. we will begin the trip to Nemrut Dagi in time for sunset photos. This entry was posted in Bible Study, Old Testament, Travel, Turkey. Bookmark the permalink.